Transition into springtime with our cream and gold shift dress. Whenever the occasion calls for a fashion-forward look with notes of whimsical, this modern edition is sure to upgrade your angel’s style in an instant. 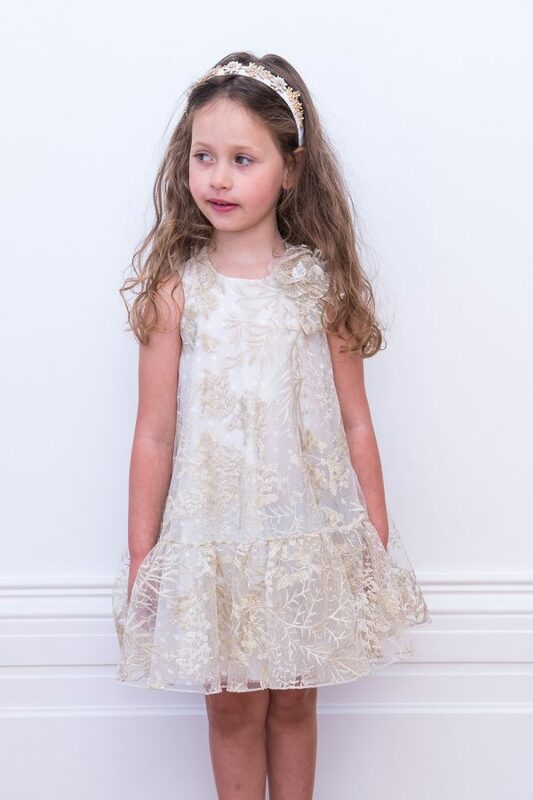 Available in a cream tulle overlay with subtle gold embroidery throughout, choose this pretty floral piece for weddings, parties and afternoon tea dates. With a relaxed drop waist and sleeveless silhouette, your girl will be sure to inspire in this new season shift dress. Details include a soft flared skirt and a layered corsage to finish her special occasion look in style. Concealed zip to fasten. Height of Model : 43 1/4″ – 109.5cm – wearing age 4 years. Score a wardrobe win for spring with our royal blue bow skater dress. Yours to treasure, this must-have gown makes a perfect choice for parties and family dinner dates. 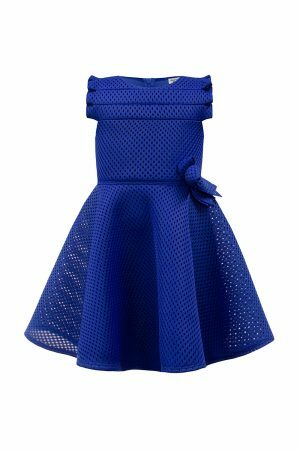 Whether your angel loves the colour blue or she needs a formal occasion look with added elegance, your little one is sure to feel like an A-Lister in this superior style. Available in a fit and flare skater silhouette with a surface interest techno mesh fabric, this dress offers deluxe craftsmanship ready for your girl to greet her next event with grace. Subtle ruffle details flatter from every angle while our bow detail lends a signature finishing touch at the waist. Concealed zip to fasten. 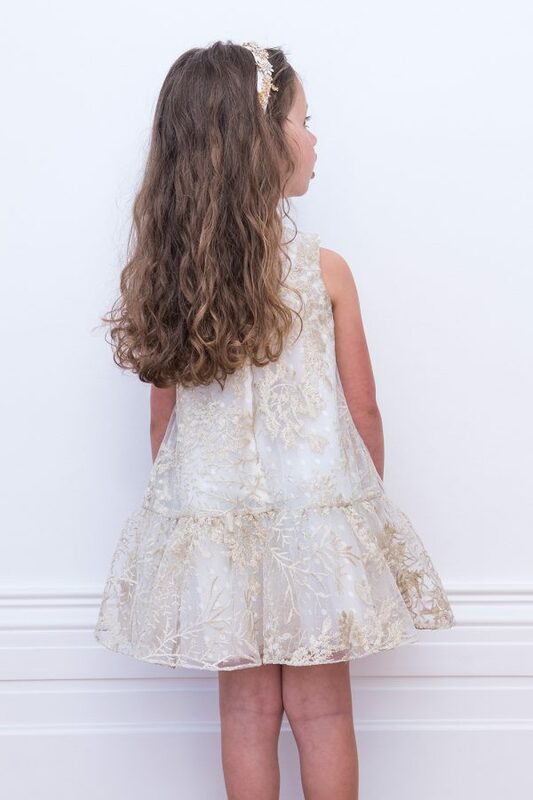 Wish upon a star in our gold ballerina bridesmaid gown. 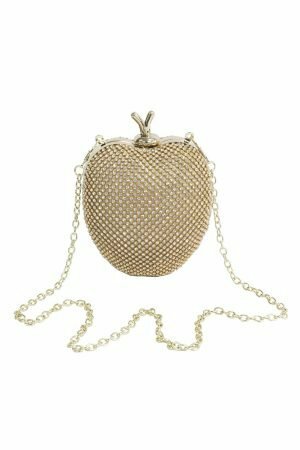 Designed with your girl's favourite occasions in mind, why not add a touch of regal glamour to her springtime look. Exclusively yours, this gold and ivory dress captures the essence of elegance and includes an embossed brocade motif throughout. With a polished a-line silhouette and fitted bodice, your sweetheart is sure to feel like a prima ballerina at her next party, prom or wedding event. Note the delicate pleated ruffle neckline, bodice trim and underskirt which offers all the star quality your angel needs to grace the new season in style. Concealed zip to fasten. Inspire and delight in our blue frosted prom gown. Expertly crafted with your girl’s favourite occasions in mind, this exquisite piece belongs in her springtime collection. Available in a multicolour blue palette with frosted silver accents for added lustre, your teen is sure to make a polished impression in this artisan occasion gown. This beautiful edition offers a timeless ball gown silhouette complete with lavish tulle layering and an abstract floral motif throughout. Note the bespoke bodice ruffle which lends a decorative finishing touch to your angel’s new season prom look. Concealed zip to fasten. Ebony elegance is the order of the day with our black formal trim dress. 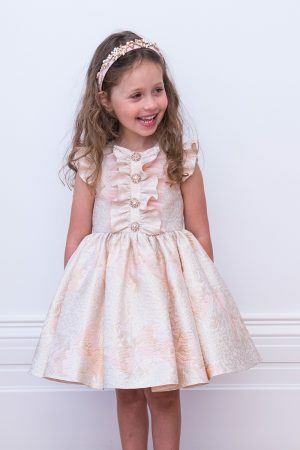 Exclusive to David Charles, watch your daughter RSVP in style as she steps out in this charming new season number. Whether your teen has an evening at the opera or a bat mitzvah to attend, this self-colour edition is sure to win her the best little black dress award. Available in a luxe mesh fabric and subtle satin striped design, now your angel can showcase her stylish new look at every opportunity. Details include a matching ruffle neckline and bodice trim for a signature day to evening look that’s perfect for springtime. Concealed zip to fasten.